- Named a Second Team 5A All-State selection by the Kansas Baseball Coaches Association as a senior at St. Thomas Aquinas (Kan.) HS. - In 2011 as a junior, hit .434 with 12 doubles and 7 stolen bases. - Committed to University of Dayton. - Also played football and was an All-5A Honorable Mention as a wide receiver. - Finished his high school career with Carl Albert HS with a school-record 74 home runs, one shy of Jeff Clement’s national record. - Finished the 2012 season with a .391 average, 28 homers and 81 RBI. - In 2011 helped his high school team win its third state title in six years in the Class 5A state final. - Committed to the University of Oklahoma. - As a junior at Cal State-Fullerton, went 10-4 with a 2.83 ERA (114.1-IP, 36-ER) with 70 strikeouts and only 13 walks in 17 apps. - In the Big West Conference, ranked 1st in innings pitched (114.1), 8th in ERA, 6th in SO and tied for 1st in wins and was named the BWC’s Pitcher of the Year. - In 2010, was named a Freshman All-American by Collegiate Baseball and Second Team Freshman All-American by the NCBWA. - Previously drafted by the Rays in the 20th round of the 2009 June Draft but elected to go to college. - Grew up in Merced, Calif. …in his four-year career Buhach Colony (Calif.) HS, went 33-5 and averaged nearly two strikeouts per inning. - Majored in communications…his older brother, Brock, is currently a graduate assistant coach for Cal State-Fullerton. - Favorites include: Chipper Jones (baseball player), AT&T Park (favorite place to play), "The Hangover" (movie), Will Smith (Actor) and the Atlanta Braves (team). - Ranked No. 316 in Baseball America’s Top 500 overall, No. 36 overall left-handed pitcher and No. 3 prospect out of Pennsylvania. - In 2012, went 10-1 with a 1.80 ERA in 70 innings pitched while tallying 101 strikeouts and 35 walks in his second season with Lackawanna College, helping them set a school record for wins in a season with 47. 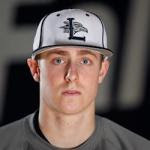 - In high school, was named All-Delco as a senior, going 5-1 with a 1.41 ERA (38.1-IP, 6-ER) and 58 SO in 8 apps for Central League champion Marple Newtown (Penn.) HS. - Previously drafted out of high school by the Pittsburgh Pirates in the 13th round of the 2010 June Draft and again following his first year at Lackawanna by the St. Louis Cardinals in the 21st round of the 2011 June Draft. - In his second year at Herkimer County CC, went 6-1 with 91 strikeouts and a 2.62 ERA (58.1-IP, 17-ER) and was selected to the 2012 All Mountain Valley Conference Baseball Team and named a First Team All-Division III performer. - Went 5-2 with a 3.35 ERA while recording 50 strikeouts in 37 innings in 2010. - Began his collegiate career at Austin Peay University in 2009 but transferred after redshirting his freshman year. - Also competed in both indoor and outdoor track and field at Austin Peay, participating in hurdles and long jump events. - Was a First-Team All-Northern County in 55-meter hurdles and posted nation’s 17th best time of 2009 in 200-meter hurdles (28.34) according to MileSplit US. Tuesday afternoon, Carl Albert catcher Taylor Hawkins said he wasn't expecting to get drafted, fearing he'd scared teams off who were worried about his signability. The Oklahoma signee said he'd heard that the fact he'd gone to several OU games had made teams think he was automatically destined for college. "It's disappointing," Hawkins said. "All I've ever wanted to do since I was little is play pro ball." But Tampa Bay took a chance on Hawkins late in the 12th round, taking him No. 392 overall. Hawkins hit 28 home runs this season, helping the Titans to a 5A state title." Keep the mechanics he came to Lackawanna College with, his coaches promised him, and elbow problems were in his future. Maybe, shoulder problems, too. So, the mechanics that were good enough to get him drafted by the Pittsburgh Pirates in the 13th round out of Marple Newton High School went out the window in favor of a rebuilding process with Lackawanna coach Chris Pensak and his assistants. Kirsch, who was also drafted by the St. Louis Cardinals in the 19th round last year, said he is hoping to sign this time around. He had planned to pitch next season at Virginia Commonwealth. Kirsch came to Lackawanna with a decent fastball and a curveball, but he has transformed himself into a legit three-pitch pitcher with the Falcons. His fastball sat between 91 and 93 mph this season, Pensak said, and it reached 94. But just as important, the mechanical adjustments - they prevent him from "over-rotating" - have helped him better command his noes-to-toes curveball. Kirsch is also using his change-up with confidence, and he has also added a dimension to his approach by cutting his fastball, too. Gabay, who pitched for the Mohawk Valley DiamondDawgs in 2011, is scheduled to pitch for the Cotuit Kettleers of the Cape Cod League. Herkimer County Community College's recently drafted baseball player Willie Gabay was named All American by the National Junior College Athletic Association, for the 2012 season. Willie Gabay, Mahopac, who became the first Herkimer player ever selected in the Major League Baseball draft when he was selected in the 15th round of the draft by the Tampa Bay Rays last week, was selected by the NJCAA as 3rd Team All American. Gabay set the Herkimer college record for strikeouts this season with 91 in 58.1 innings. He allowed only 37 walks and 28 hits. His earned run average was 2.62 and his record was 6-1, with four saves. Gabay was a two-year starter for the Generals. He earned Mountain Valley Conference Player of the Year honors as a sophomore, he was a First Team All Region selection and was also named the Generals' MVP. Gabay signed his contract with Tampa Bay this week and is processing in Florida right now waiting for his assignment.